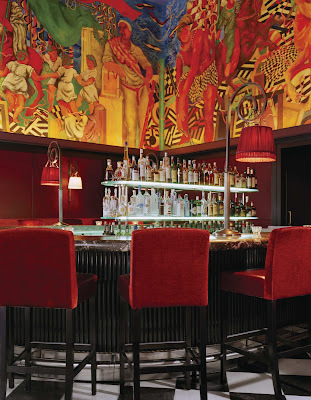 The bar with the famous red mural named after a horse race in Italy is back! After an absence of a few years, Michael Cetrulo has reopened this location and named the bar Palio and the upstairs dining room Piano Due. While the bar area remains as charming and romantic as ever, the upstairs dining room has undergone a significant transformation. Whatever the occasion, the Palio Bar provides an enchanting backdrop for an unforgettable interlude. The hand painted mural of the famous Palio horse race by Sandro Chia is draped across the four walls drenching the room in warm hues of red, orange and gold. Sinking into a plush upholstered chair with a favorite cocktail one can’t help but be inspired by this artists metaphor of life lived to the fullest. Just say "Cin-cin," cheers in Italian!